This signature tour takes you over five of NYC’s most iconic bridges: the Brooklyn Bridge, Manhattan Bridge, Williamsburg Bridge, Queensborough Bridge, and the Pulaski Bridge. The first one we cross is the Queensborough Bridge, a.k.a. 59th Street Bridge. Then we travel through NYC’s newest neighborhood, Long Island City. The next bridge we travel over is the Pulaski Bridge, which crosses over the Newtown Canal that separates Queens from Brooklyn. Once in Brooklyn, we travel through the trendy neighborhoods of Greenpoint and Williamsburg. 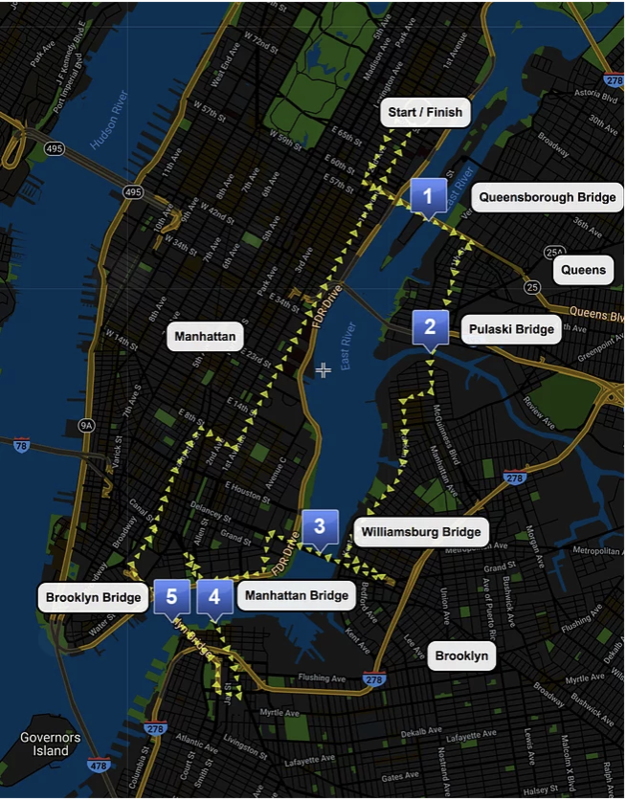 The next stop is the Williamsburg Bridge, which takes us back into Manhattan, where we travel to the East River Greenway until we reach the Manhattan Bridge. We cross the East River once again back into Dumbo, Brooklyn. The next bridge is one of the most famous in the world, the Brooklyn Bridge. Once in Manhattan, we travel uptown past City Hall/Federal Plaza to our final destination at 75th & 1st Ave.